In this enchanting novel set at Cedar Cove's cozy Rose Harbor Inn, Debbie Macomber celebrates the power of love -- and a well-timed love letter -- to inspire hope and mend a broken heart. Summer is a busy season at the inn, so proprietor Jo Marie Rose and handyman Mark Taylor have spent a lot of time together keeping the property running. Despite some folks' good-natured claims to the contrary, Jo Marie insists that Mark is only a friend. However, she seems to be thinking about this particular friend a great deal lately. Jo Marie knows surprisingly little about Mark's life, due in no small part to his refusal to discuss it. She's determined to learn more about his past, but first she must face her own -- and welcome three visitors who, like her, are setting out on new paths. Twenty-three-year-old Ellie Reynolds is taking a leap of faith. She's come to Cedar Cove to meet Tom, a man she's been corresponding with for months, and with whom she might even be falling in love. Ellie's overprotective mother disapproves of her trip, but Ellie is determined to spread her wings. Maggie and Roy Porter are next to arrive at the inn. They are taking their first vacation alone since their children were born. In the wake of past mistakes, they hope to rekindle the spark in their marriage -- and to win back each other's trust. But Maggie must make one last confession that could forever tear them apart. For each of these characters, it will ultimately be a moment when someone wore their heart on their sleeve -- and took pen to paper -- that makes all the difference. Debbie Macomber's moving novel reveals the courage it takes to be vulnerable, accepting, and open to love. 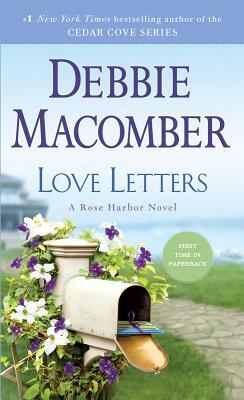 Love Letters is the third book in the Rose Harbor series by popular American author, Debbie Macomber. As Jo Marie prepares Rose Harbor Inn for her weekend guests, she finds herself once again intrigued by her cranky handyman, Mark Taylor. A gifted carpenter, Mark is going to build Jo Marie a gazebo, but she doesn’t know anything about his past and can’t help wondering, can’t help asking. Maggie and Roy Porter have been treated to a weekend getaway by his parents, but Jo Marie notices the tension between them immediately. She hopes the Inn will work its healing magic on them, but she has no idea of the magnitude of what has passed between them. Perhaps Roy’s old love letter can heal such deep wounds, but there is yet another shock in store for this couple. Ellie Reynolds has come to Cedar Cove, against her mother’s wishes, to meet a man she knows only from online and telephone contact. She’s half in love with Tom already, but her mother is mistrustful of any man after Ellie’s father abandoned them. But Tom seems to be everything Ellie has ever wanted. They click from their first contact. But can the budding romance survive the surprise that Tom has in store for Ellie? Jo Marie is still negotiating her own grief for the loss of her husband, Paul, and when cleaning, tidying, prying into Mark’s life and baking fails to provide sufficient distraction, Rover, her rescue dog, reminds her of Paul’s last letter. Macomber’s format for the full-length books of this series seems to be the stories of two sets of guests at Rose Harbor Inn with snippets of Joe Marie’s life interspersed, and the mention of the next book’s guests in the final chapter. She gives the reader believable characters with realistic and often topical dilemmas, and while the queen of feelgood specialises in happy endings, the road is not always a smooth one. Heart-warming and enjoyable.